The finished product! Acrylic paint on a well baked salt dough is a great medium for your artistic visions. After painting my dog Emmett’s footprint, I touched it up with a Sharpie. Likewise with BB8 — I drew his details in with a permanent marker. Then I coated both ornaments with five layers of Modge Podge. Salt dough is a perfect medium for dog prints, baby feet, adorable hand-made things, and even lover thumb prints you see on Etsy. Go nuts, and share in the comments! I was determined to make a Christmas tree ornament of our dog Emmett’s paw print this year. I never did capture a paw print of my late Peanut, and that’s one thing I wish I had in some form. The dough rolls easily, is not sticky, and is easily transferred to a cookie sheet for baking. Emmie was so good with making her paw impression that I decided to use my leftover dough to try my hand at a raised ornament, too. For the impression, I simply cut a circle in the flattened dough, bribed the dog with treats, and had her stand on the counter for a minute. For the raised ornament, I simply used the spare circle of dough, rolled the rest by hand to make some spheres, and placed them on the background circle with drops of water. After baking the ornaments in the convection oven, I used acrylic paint as a base layer and let them dry for 24 hours. When baking them, don’t worry about burning them or achieving an even color because you’ll paint them. Instead, bake them enough so there is no more moisture in the dough. Extreme over-baking will cause the dough to crumble, but as all things in life, moderation is key. Bake 10 minutes at a time until the ornament is hard. Please stand by for photos of the finished ornaments! I try very hard not to constantly talk about my wedding all the time, in person and online, but we are closing in and today was a banner day! I’ve managed my fair share of big projects and events before, but this is the first of either that changes my life forever. While meeting with our caterer and cake baker, Christine, I described my approach to our wedding: Instead of finding a checklist of all the traditional wedding things I “need” to do or have, I built up from scratch with the mindset that Jeff and I are getting married, and we want to celebrate! One thing required to celebrate is definitely cake, and we had a lot of cake today at our tasting. Christine told us to pick all the flavors we wanted to try, but we only wanted to taste what we could see ourselves actually having. That’s a good approach in theory, but we couldn’t resist several flavors. Although we got to the point that we wanted to talk specifics, we kept eating! 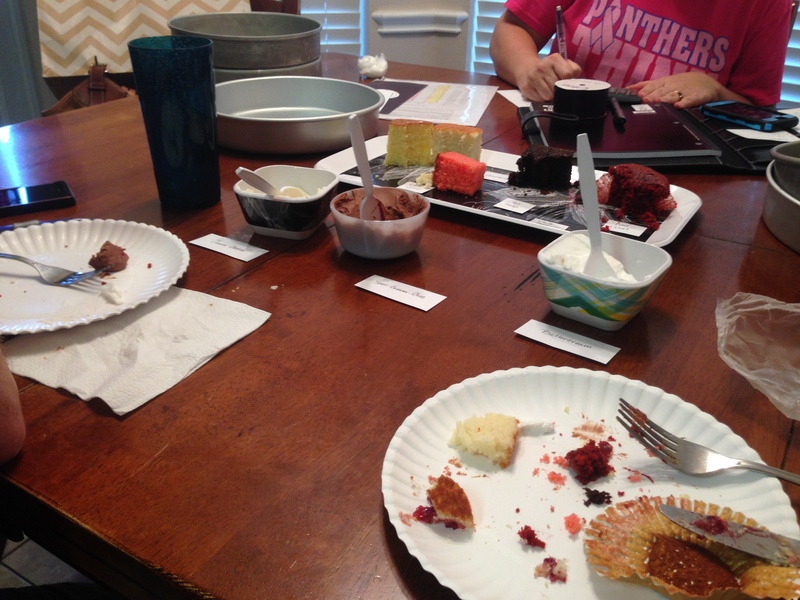 The cake samples were pretty much devoured. Food and cake are pretty much nailed down. Whew! I also bought our wedding bands today. Huzzah!! I didn’t get the one I’d had my eye on all this time, but I’m so happy with what I got. It matches Jeff’s ring more, and it’s a ring I’ve adored since the first holiday season I worked at James Avery years ago. Among my other accomplishments, I survived a Walmart today. I, of my own volition, entered a Walmart. I wanted to price check some wedding decorations, but I also needed some crafty items. I also justified that I needed a bottle of wine, and Walmart was the only place with everything I needed. I rocked through all of my list in a sprint until I hiked from household to food and made a straight-shot for the wine aisle. Of course, because it was Walmart, a patron in a motorized cart moved and adjusted her cart to align with the entrance to the wine aisle! She didn’t just randomly end up blocking the aisle, she stopped, reversed, adjusted, and proceeded to set up camp. I witnessed two “excuse me” interactions and attempted my own, but she cared not a jot for blocking us from our booze. Although I was annoyed that I had to go down another aisle just to come up the wine aisle, I figured the extra steps would help to counteract the cake tasting to come! Come on, though, no one at Target or Tom Thumb blocks people from the booze aisle. That wacky stuff only happens at Walmart. The good news from my Walmart adventure? I now have a cake topper (such a random, unnecessary piece of fluff! I was not going to spend a cent on one of those stupid cake toppers, such as the bride dragging the groom, or the ball-and-chain crap, or Hello 80s! something from Precious Moments.) But I was willing to make something that went with our theme! Another project finished after the trip to Walmart was a sign I want to hang in a grouping my mom, sister, and I planned to draw attention to the door to the bathroom. My mom acquired an antique room divider years ago, but she hasn’t done much with it. The wood is old, and the hinges are old, but it’s really pretty. We decided to use it as a decoration instead of as an actual room divider because, frankly, it needed more work than I cared to exert. My sister and I have dubbed it the Janky White Thing (JWT). I have almost completed the decoration for the middle of the JWT! Decorations, rings, food… whew! Today was a very “wedding” day, and this is a very wedding post. I’m winding down tonight with wine and Wheat Thins. 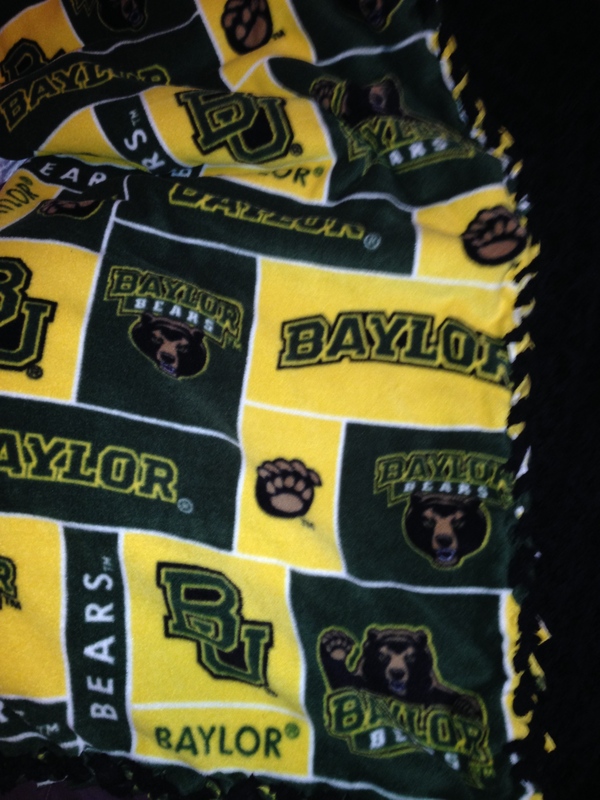 I’m going to the Baylor-OU game on Thursday, and after regularly checking the weather forecast, I realized I needed a stadium blanket! 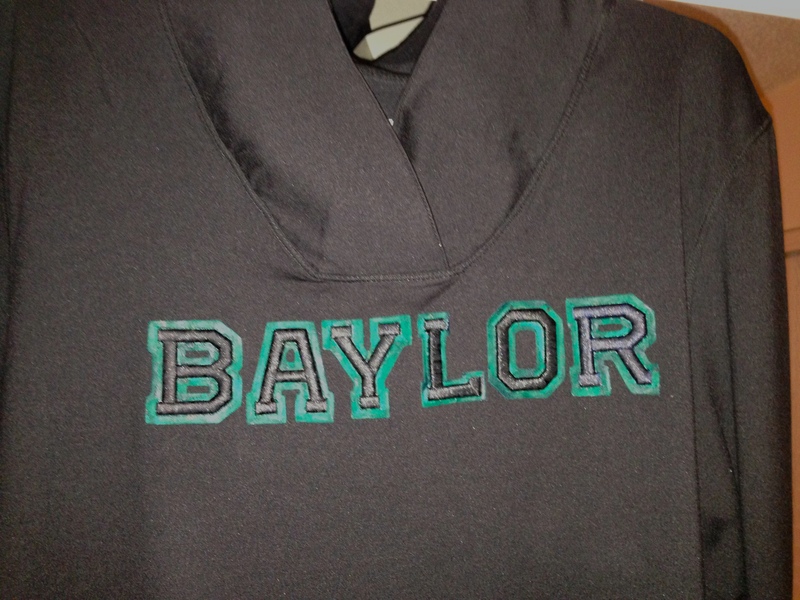 I got some Baylor fleece from Joann’s, and some super-soft solid black fabric. 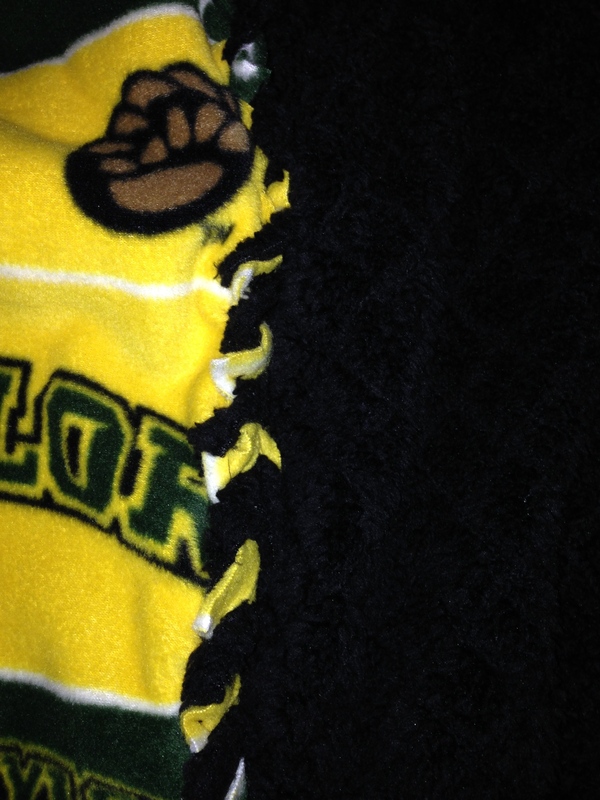 I basically went with a combination of the traditional no-sew fleece edge-tying method and a braided-edge method. I saw the braided edge on Pinterest first, but another method worked much better for a double braid. 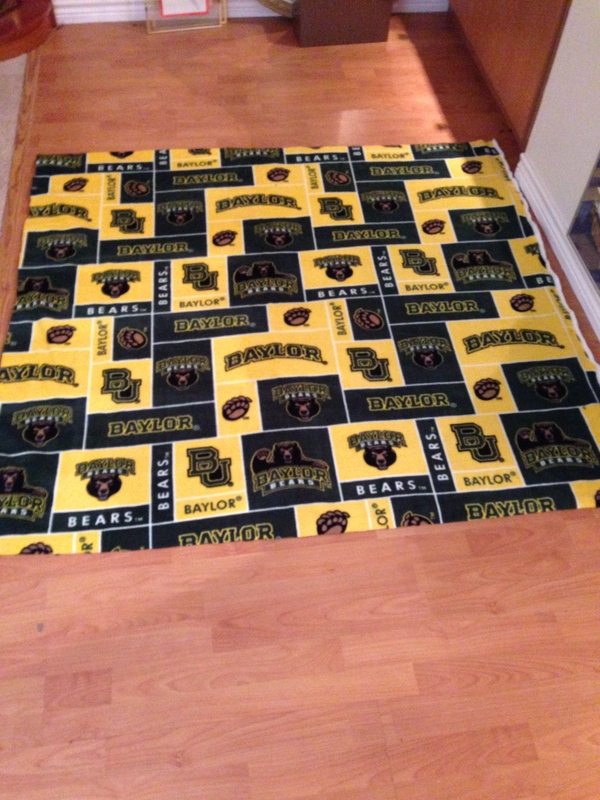 Edit: The reason I didn’t like the pattern at first, I now realize, is because they’ve taken every single Baylor Bear logo and threw them all together. I think repeating one or maybe two logos would make more impact and be easier on the eyes. I’m not a “more is more!” person. For the #EveryoneInBlack game, however, we can snuggle with the offending pattern-side down. A disclaimer about no-sew blankets: They require little-to-no sewing, but that doesn’t necessarily make them easy to make, in my opinion. 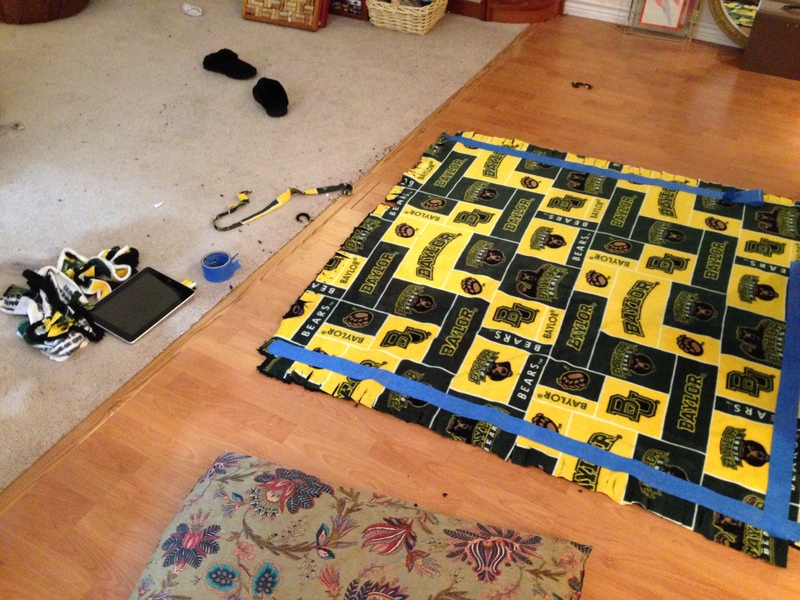 This particular two-sided no-sew blanket required a lot of cutting, which took about two hours. 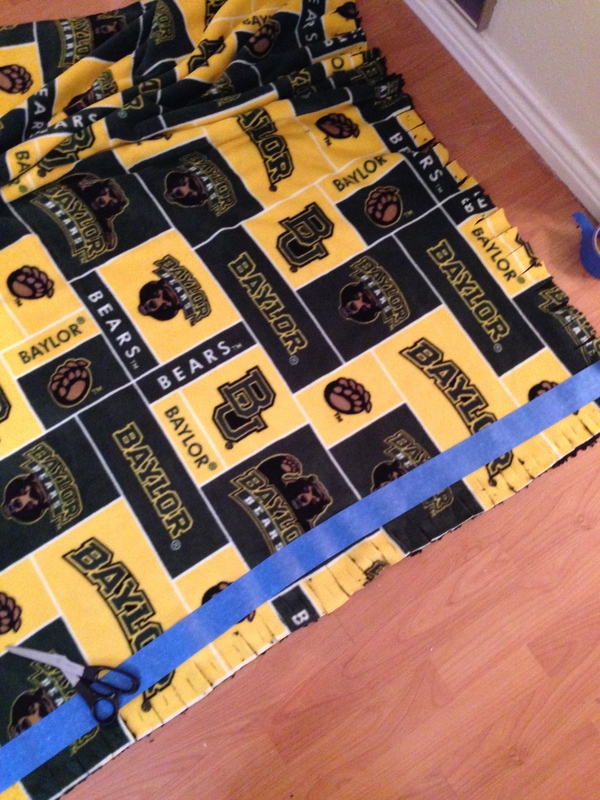 I laid each layer right-side-out, backs together and trimmed the edges to eliminate the salvage and to fit. I cut the fringe across each side, and then went back and cut the slits in the fringe that allow for the braided look. 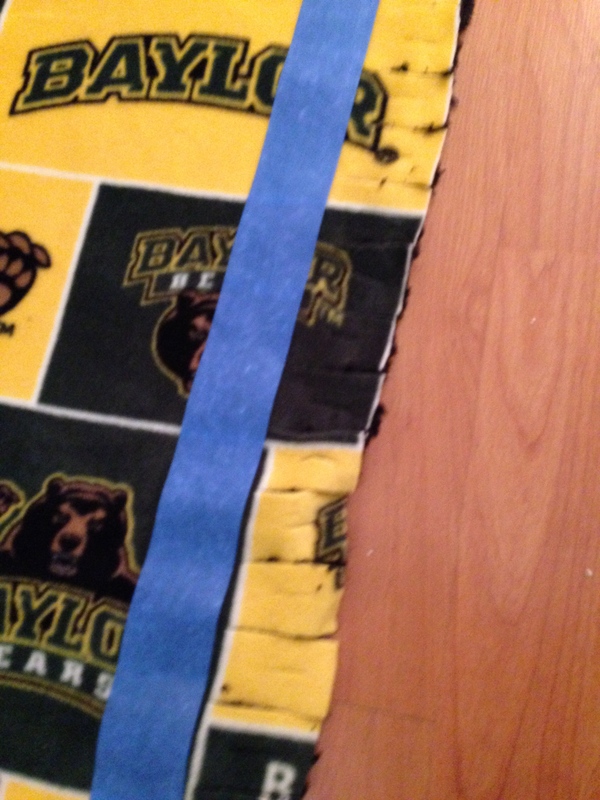 Using the painter’s tape helps while cutting the fringe, but pulling it off to re-use it on the next side jacks up the alignment of the two layers of fleece. If you use the tape to help cut, leave it on until you’re done with all the braiding or tying. 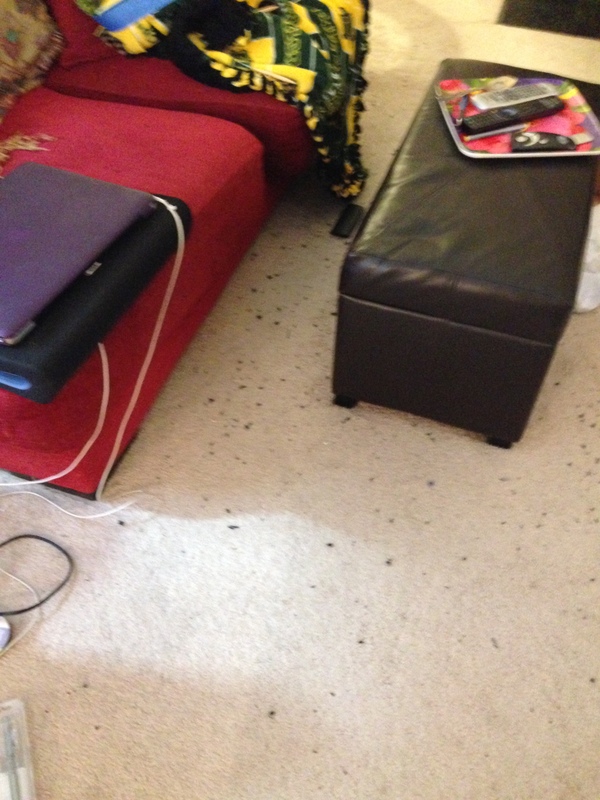 I vacuumed immediately after this picture was taken, but little fleece fuzz balls are still all over my house! Here’s a close up of the braiding. 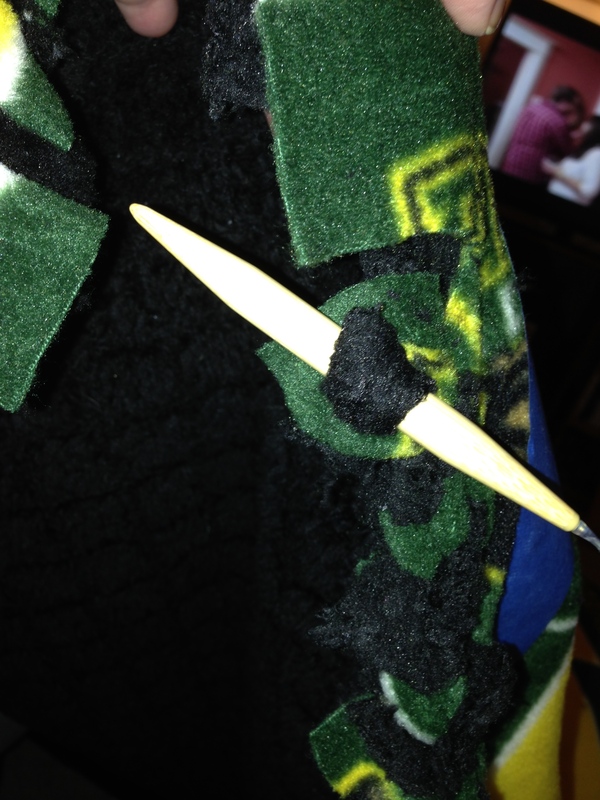 I used a knitting needle. I think a crochet needle would be ideal, but I couldn’t find mine. If you looked at the tutorial I linked to, you can see that anything can work to finish the edge, even a paperclip! I had some sewing to do at this point. Cutting both layers of fringe and slits at once meant that several times I cut the slit to close to the edge on the black fabric. I had to stitch those back together. I also tacked the braid in several places to give the edge some support. Possibly unnecessary, but it’s for my peace of mind. Also, the last two fringes in the braid looked nothing like the tutorial I linked to, so I finished it with needle and thread to secure it and make it look consistent. OK, last picture! Here’s the done deal! DIY #EveryoneInBlack shirt. Sic ’em Bears! Simple black Baylor football shirt from the bookstore (which I would NEVER shop at because I worked for the Spirit Shop back in the day — total rivals, yo). Personally, I decided to make my own. I guess I was inspired by the Midlothian Panther spirit shirt I recently bought and wanted to have total control of my own #EveryoneInBlack Baylor shirt. 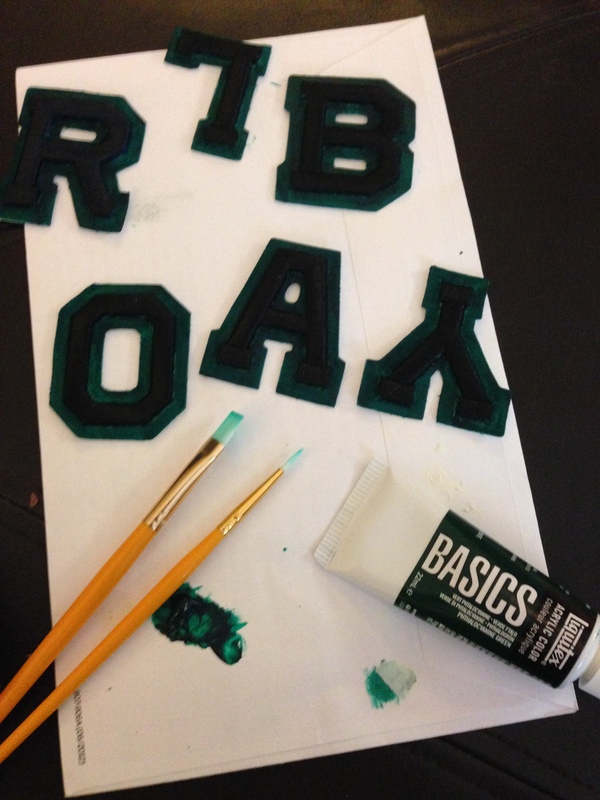 I started with a long sleeved shirt, tweaked some felt-backed letters, and viola! 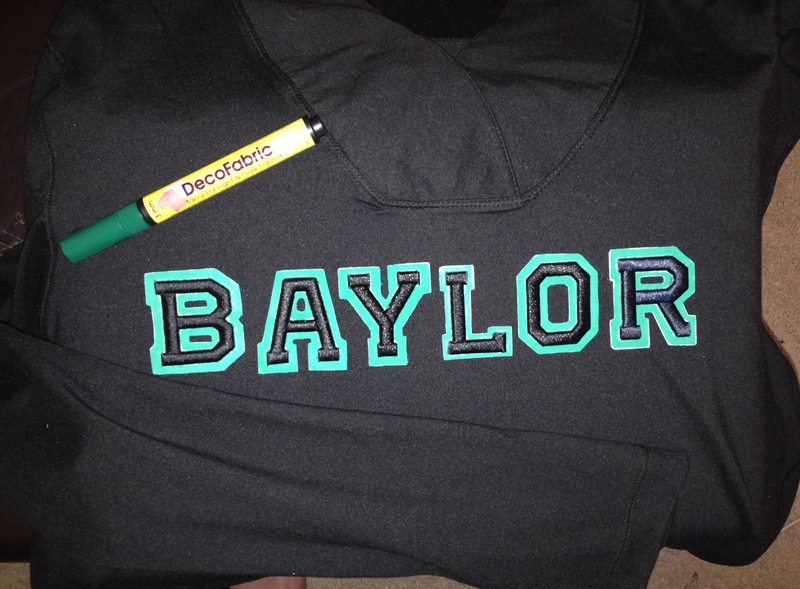 A Baylor blackout spirit shirt! Here’s a brief DIY step-by-step for interested parties. 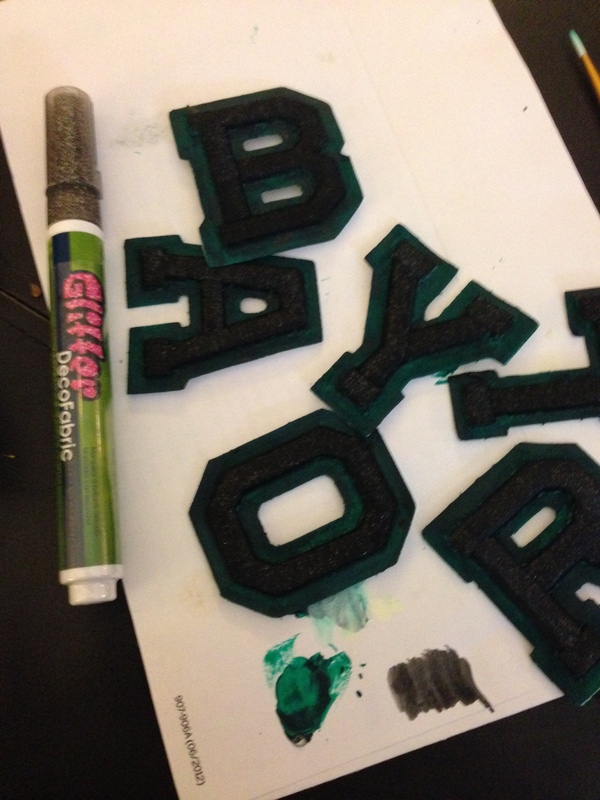 Then I applied black glitter paint to the embroidered letter. The test subject looked good, so I went for it! I want some bling, you know?! 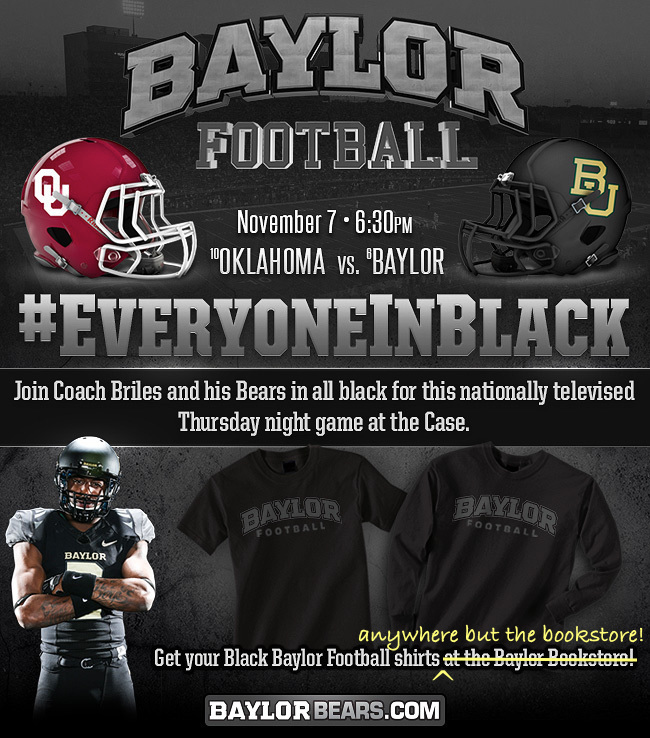 #EveryoneInBlack Baylor shirt to blackout the Sooners!